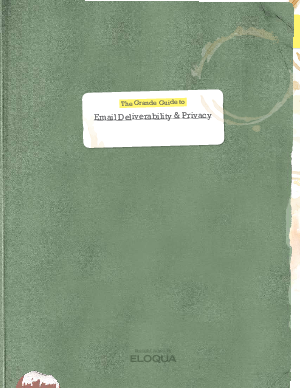 > Eloqua > Are You Properly Safeguarding the Personal information contained in your mailing database? In the time it takes you to drink a cup of coffee, you can become proficient on a key marketing topic, in this case, email deliverability and privacy. When it comes to email, privacy is about safeguarding the personal information contained in your mailing database. This includes honoring the opt-in/opt-out, data access, and data destruction wishes of the data subject. Learn about the importance of privacy and deliverability and why it should matter to your organization. Explore the basics and best practices, discover tools and technologies, and find out about the future of email deliverability and privacy.